Has your company recently entered a new market, and you are not sure of the main players — or those who are dark horses? 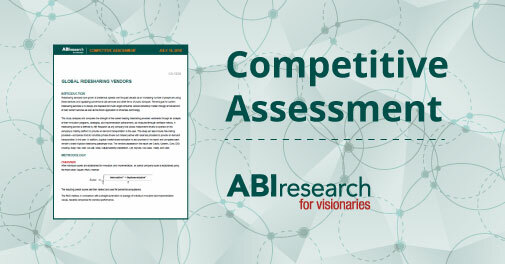 ABI Research’s Competitive Assessment reports offer comprehensive analysis of implementation strategies and innovation, coupled with market share analysis, to offer insight into a company’s performance and standing in comparison to its competitors. These reports, which often include easily absorbed charts and tables, may cover a dozen or more companies. They also provide a detailed explanation of the rankings, including an Executive Summary, and the Vendor Matrix Results that clearly indicate the Market Leaders, Followers, and the Laggards. Additional content may include Innovation Criteria, Implementation Metrics, and Market Shares. Regardless of your transformative technology interest, ABI Research does provide a free sample PDF of a Competitive Assessment report, which includes the first couple of pages of the Competitive Assessment. Just complete the brief form to download the Competitive Assessment sample. If you wish to receive the full Competitive Assessment report, which is more than 30 pages, click the “Request Full Research” button at the top of the brief sample PDF, and a Sales representative will follow up with you. Or, Contact Sales directly. By 2030, the number of production-ready additive manufacturing platforms that ship each year will increase more than tenfold (more than US$325 billion in hardware and related systems revenue). These systems will produce more than US$360 billion worth of parts and end products each year (up from US$6.8 billion today) and nearly US$2 trillion in sum by the end of the next decade (MD-AMMT-101). These systems will need to work with the ones that came before them. Today, most do not. The field of Manufacturing Operations Management (MOM) is, like the systems it supports, evolving from manufacturing execution (data acquisition) to digitalization (data synchronization and contextualization) and, soon, higher levels of intelligence (data augmentation). Companies like PTC, which acquired Frustum at the end of 2018 (after the US$1 Billion Rockwell tie-up) and Siemens, which acquired low-code developer Mendix on the heels of its of Mentor Graphics pickup (in 2018 and 2017, respectively), have started to show their cards, and there are several key takeaways the industrial industry must heed. The Latin America cellular M2M market will grow to 71.3 million connections by 2023, but few Mobile Network Operators (MNOs) have implemented successful monetization strategies according to a new report by ABI Research, a market-foresight advisory firm providing strategic guidance on the most compelling transformative technologies. Latin American operators must develop new business models and move up the value stack in their solution offerings beyond just providing connectivity to drive the market forward and capture value. “While there is a US$1.1 billion opportunity on the horizon for total IoT solution revenues, Latin American operators still lack a clear strategy of where they want to fit in the overall value chain,” said Ryan Harbison, Research Analyst. “These solutions require a B2B mindset and operators are fixed on B2C due to an overly saturated and competitive mobile market. 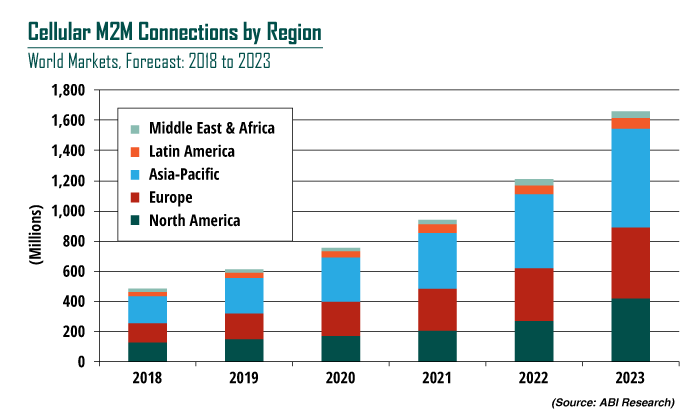 Additionally, M2M connections currently represent 5% of total connections and only 1% of revenues across the region, so for most operators, the revenue per connection isn’t where it needs to be to justify increasing their M2M investments and engagements.” Read more. The United States has a unique 5G starting position due to its market size, the financial health of its Mobile Service Providers (MSPs), and the forward-looking moves of the Federal Communications Commission (FCC). “The United States has a stronghold because its carriers have an enhanced fiscal position — they will spend approximately US$40 billion on network infrastructure alone during 2019,” says Emanuel Kolta, Research Analyst. Read more. "Companies need to ensure consumers are buying products they feel are secure and protected," said Jonathan Collins, research director and smart home analyst at ABI Research. "That can take a whole range of issues like educating users or better management of devices or putting more details into the app about how the camera is operating." Read the full article. In support of ABI Research's recently launched Industrial Solution, Chief Research Officer Stuart Carlaw shared his thoughts on digital transformation's emergence in the industrial market during an interview with Manufacturing Tomorrow. Topics also covered were challenges companies will look to overcome, the technologies most closely associated with digital transformation, and how our Industrial Solution can help companies lean in to digital transformation. Read the full interview.